By Tim Clue and Spike Manton. Cast size: 3m., 3w., may be expanded to 4m., 4w., 18 either gender. This title can be licensed and sold throughout the World. Please note this title may be restricted in your area and may require additional processing time. * Please note the royalty rate listed is the minimum royalty rate per performance. The actual royalty rate will be determined upon completion of a royalty application. The spark behind Leaving Iowa comes from being children of parents from the now dubbed "greatest generation." The story is a toast to their idealism and character and a little roast of their undying dedication to the classic family road trip. More specifically, it is the story of Don Browning, a middle-aged writer, who returns home and decides to finally take his father's ashes to his childhood home, as requested. But when Don discovers Grandma's house is now a grocery store, he begins traveling across Iowa searching for a proper resting place for his father. This father-and-son road trip shifts smoothly from the present to Don's memories of the annual, torturous vacations of his childhood. Don's existential journey leads him to reconcile his past and present at the center of the United States. Leaving Iowa is a postcard to anyone who has ever found himself or herself driving alone on a road, revisiting fond memories of his or her youth. Premiered at the Purple Rose Theatre Company. "This was a new thing for us, doing a play. We are a small school and this play worked great for us. No real scene changes [and] the CD with sound effects was a huge plus." Review by Rusty Ruggles, Aledo High School, Aledo, Ill.
"Leaving Iowa was the "perfect storm"Ña play the actors, director and audience could all embrace. While offering belly-laugh moments, it still manages to be a beautiful father-son story. The play is simply "genuine." I highly recommend it!" "Historically funny production to which audience members can really relate." "A wonderful combination of nostalgia and humor, tears and laughter. One parent commented, "I like a Broadway musical as much as the next gal, but this show made me think. And I enjoyed the process." Familiar without being cliched. Lots of room for character development, over-the-top acting." Review by Stephen Duennebier, Brunswick School, Greenwich, Conn.
"Excellent vehicle for teaching both serious drama and comedy to actors within the same package. A lovely play about reconciling the past with the present." Review by Cheryl Neidt, Springfield Public School, Springfield, Minn.
"Tremendous audience response. Play succeeds as a comedy and nostalgia. Many audience members could relate to their own family car vacations. Sound track was superb." 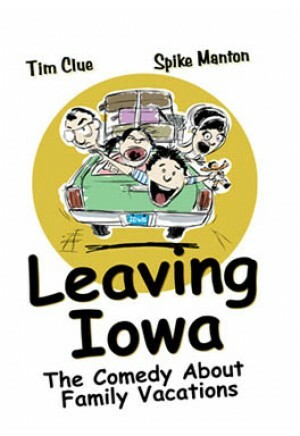 "Leaving Iowa is a heartwarming comedy. Our theatre rocked with laughter! At the end, people were coming out with happy, tear-streaked cheeks. The cast and audience loved this play!" Review by Barbara Keith, Lanesboro Community Theater, Lanesboro, Minn.
"What a marvelous play! A great combination of laugh-out-loud hilarious and tender, redemptive, sentimental family love. Our audiences loved it and we had bigger houses by far than usual. The writing is excellentÑso perfectly reflects the backseat and front seat family vacation experiences before the "plug-in" generation." Review by Ann Dolan, Lancaster Community Players, Lancaster, Wis.
"Follow the suggestions to keep the set simple. Don't let it get in the way of the story!" Each poster includes a text box which allows you to customize it with your production information. Once a poster has been opened, position your mouse over the lower third portion until you see a label with instructions on entering your production information. Use the Text Select Tool to customize your poster. You can print the poster in its original format and hand write your information. Your local copy shop should be able to create prints from a file saved to disk. They might even be able to increase the size of the poster for you (although some loss of resolution will occur). Poster permissions: Please note that while the posters are customizable, the graphics and credits on each poster are not. The permission to manipulate any of the posters on our website is strictly limited to the production promotion box at the bottom of the poster. The graphics and all other text including author credits, title, etc., may not be manipulated in any way. This permission does not include the right to reproduce the graphics on any other media without the express written consent of Dramatic Publishing.